As a kid you probably spent some time pouring over sticker books or collecting stickers characters from vending machines. You may even have a bumper sticker or two on your car. However, past being a novelty item, stickers have a strong promotional power. In fact, stickers are probably one of the most cross-functional marketing techniques your business may ever utilize. Consider this, how many products leave your company each day? How many letters? Packages? Every item that exits through your door has an opportunity to send a message. Easiest way to communicate this message: a sticker. Print packs of them; take half a second to slap a couple on, and voila-your branding, front and center and in the hands of your people. 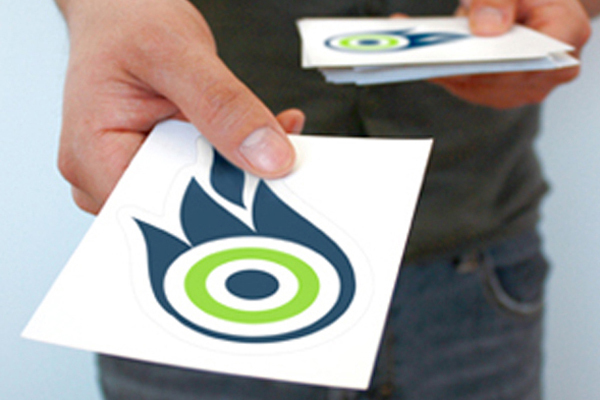 Business logo stickers are such a versatile way to market your company. They can be used to attach your branding to anything. Bumper stickers, window decals, envelopes, lamp posts, consumer packages, promotional products, and more. The more people see your sticker, your logo, the faster they will remember you, the better top-of-mind awareness your company has. Stickers make great swag products as everyone loves a nice shiny sticker, but they can also be used to get information into the hands of the users fast. Stickers can contain directions, ingredients, facts; basically any information, and designed in such a way that they attract people. This is one of the reasons stickers are used so often at events. Stickers from a concert or sporting event make cool memorabilia or swag, but it also puts website addresses and QR codes right in the hands of the audience. The audience then sticks their stickers places where a million or so other people end up seeing them as well. Stickers also create a sense of excitement. They are usually very cost-effective and you can create plenty for a reasonable price. People just generally like stickers and will collect them even when they don’t need them. So using stickers is a fun and interactive way to engage existing customers or attract potential customers. If you do decide to use stickers as a marketing tactic, and we recommend you do, you should probably go with quality stickers. If your company name is going to be on them, and your clients are going to see them, you will want stickers that are bright, clear, stick well and effectively communicate. StickerYou to the rescue. Check out StickerYou.com for more ideas on how stickers can help market your company and talk to one of our salespeople to learn more about how to make your brand stick.